Why Amnesty says "protect the human" AND "join a union"
Amnesty International is one of the best loved organisations in Britain, regardless of whether you grew up with the Secret Policeman’s Balls (which in the late 1970s were the adult equivalent of early 1970s playground recitations of Monty Python sketches – only with the original cast on the stage leading the chorus!) Everyone knows they help people who need help most – especially the political prisoners for whom they were founded. Today (25 February), Amnesty and the TUC signed a formal agreement to work together. The TUC promised, among other things, to take part in 25 Amnesty urgent actions every year, and increase the number of union affiliations by 10% a year. And Amnesty, whose slogan is “Protect the human”, will encourage its members to join unions so their rights can be better protected at work. 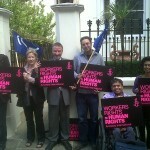 So while we work together to support union rights abroad, Amnesty will be working with us to organise at home. The memorandum of understanding was launched by TUC General Secretary Brendan Barber and Amnesty International UK’s Chief Executive Kate Allen in front of TUC and Amnesty staff and members of the TUC General Council. The memorandum is here, Brendan Barber’s speech is here, Kate Allen’s is here and our joint press release is here.